I really love the concept of a book that asks the question: “what would life be like if this one thing were changed?” Characters go back in time and undo a wrong, or turn left instead of right and then fast forward to see where life has taken them instead. Or someone (something?) comes to them from the future to show them who they will become if they continue down the current path and gives them the opportunity to change (thank you Charles Dickens). Many of us have wondered before what would my life be like if I… I don’t think I’ve mentioned here before, but I’m a huge fan of the show Friends. (Seriously, super-nerd, can quote it line-for-line.) (It’s a little sad.) (Don’t judge!) One of my favorite episodes is The One That Could Have Been (see?) where they imagine what would happen if Monica were still fat, Chandler quit his corporate job, Joey were still a Soap star, Phoebe worked for Merrill-Lynch, Rachel got married and Ross didn’t get divorced. They’re still the same people a the end of the day, but they behave differently and have a different definition of happiness because of the choices they made. Instead of wondering what you like would be like in the future, what if you just showed up in it? Synopsis: Alice and Nick are newlyweds who have bought a massive fixer-upper house and know they are in over their heads, but at least they are in it together! So imagine Alice’s surprise when she finds out she a Nick are getting a divorce! Poor Alice has hit her head on a spin bike at the gym and thinks it’s 1998, when she and Nick were 29 years old, deliriously happy and expecting their first baby. Only it’s actually 2008, she is about to be 40, she has 3 kids and gorgeous remodeled house with a pool and is in the middle of a nasty divorce. Some other things she is surprised to find out: she is quite thin, she has chic hair and fancy make-up, she drives a monster SUV (whatever that is), she is a super-mom at her kids school, her own mother is remarried (to Nick’s father!) and she has a boyfriend, apparently! The problem is, Alice has no memory of the last 10 years whatever. She doesn’t even know the names of her 3 children. Every time someone reveals information about her life and her personality, Alice struggles to connect to this outgoing, organized, upper class woman they describe. How could she possibly like coffee? How could she ever stand up in front of all the other parents at school and lead meetings? How could she possibly ever hate Nick and let go of their marriage? 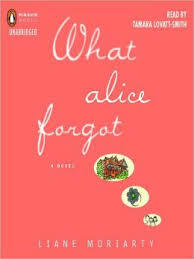 As little snapshots and whiffs and voices begin to fill back in, Alice has a hard time deciding what is real and what is memory. Over the course of a week she goes on pretending to be 40 year-old Alice and lives the life she is supposed to, but with one goal in mind; she must stay married to Nick. When her memory comes flooding back to her, Nick knows immediately, just by the way she looks at him. And the spell is broken that quickly. But Alice can’t forget what happened while she forgot who she was and she must sort out who she is; young Alice, old Alice, or just this Alice. My Impressions: I always write a longer synopsis when I like the book! And use excessive exclamations! I really enjoyed the concept of this book the most- what would happen if you woke up one day 10 years into your life with no memory of it? Panic probably. But the character structure of the story was so good too. Alice of course has a bit of a split personality from who she was and who she is. Her sister serves to be a bit grounding for her, as she was when they were young. But she is really quite a mess and it seems their roles have reversed over the years. Her mother and stepfather are comic relief. There is the outsider perspective of Frannie, the grandmother, and the voice of reason and wisdom. Her children are tension and interest and conflict. And then there is the dichotomy of Nick and Dominick (the boyfriend) also representing Alice’s past and present. And then, buried in Alice’s memory is a character (Gina) that had much to do with how her life turned out, and Alice has no idea who she is! The beauty of all of this is that the story could happen in any city, any (modern) time period, and it would still be the same because of the network of characters surrounding Alice. I also just really liked the premise of this book. What would happen if you could hit reset and forget about a stressful chunk of time? Or go back to when you were just blissfully ignorant, or stupid happy? Even if things weren’t perfect, you hadn’t yet managed to foul them up so completely. I like the idea of a do-over. Not entirely a you-live-you-learn senario, but if you could examine your current life with the innocence of youth, what would you think of who you’d become? That’s a lot of what this story is about and it poses an interesting philosophical question for the reader. Why you should read it: I was accused this week of only reading chick-lit and nothing that a guy would be interested in; could I please read a little sci-fi? Maybe next time; this is pretty much chick-lit through and through! But it takes a unique approach and it’s definitely a good all-girl book club pick. Open up the sauvignon blanc and get chatting!